In 2017, according to our preliminary data, flowering began on June 24th with one head at the Aanenson remnant. The latest bloomer was a 5-headed plant at Steven’s Approach, and the last day its last head shed pollen was August 26th. 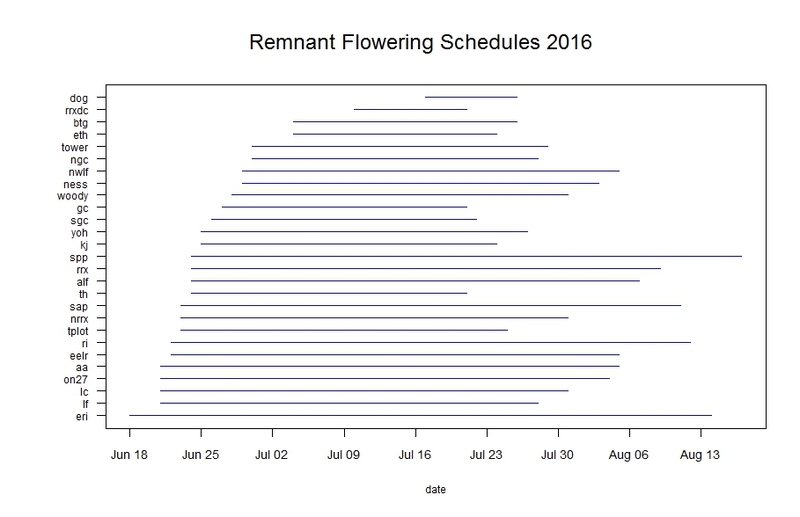 Peak flowering for the 9 remnants we observed this year was July 13th. There was a total of 427 flowering plants producing 575 flowering heads. The figure below was generated with R package mateable, which was was developed by Team Echinacea to visualize and analyze phenology data. The gray shaded area is made up of horizontal gray lines, each representing the duration of one flowering head. 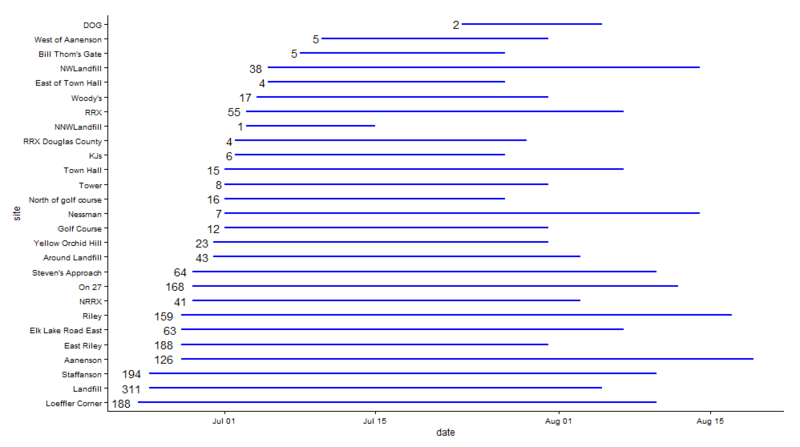 The vertical green line represents the peak flowering date, July 13th. On average, heads flowered for approximately 2 weeks. 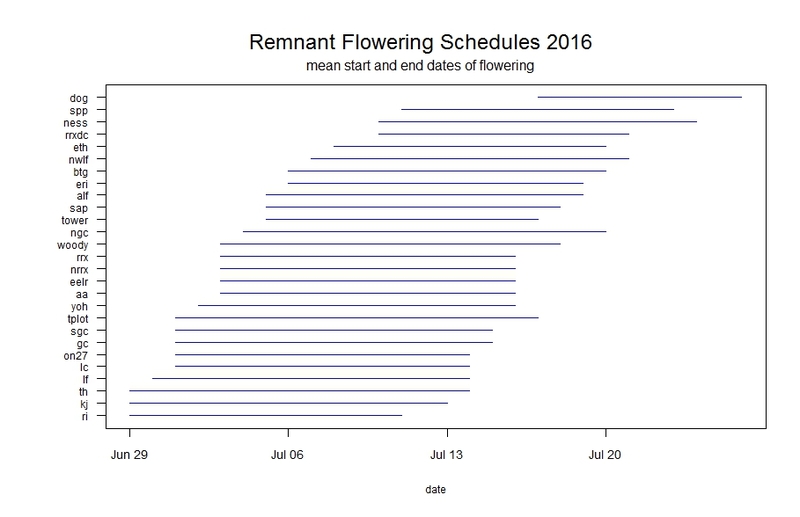 From 2014-2016, determining flowering phenology was a major focus of the summer fieldwork, with Team Echinacea tracking phenology in all plant in all of our remnant populations. Stuart began studying phenology in remnant populations between 1996 and 1999 and several students also studied certain populations in following years. The motivation behind this study is to understand how timing of flowering affects the reproductive opportunities and fitness of individuals in natural populations. We harvested 121 Echinacea heads at 8 of the 28 remnants. These were harvested from Lea and Tracie’s “rich hood” (richness of neighborhood) plots. Not all harvested heads were monitored for the phenology dataset. Data collected: We identify each plant with a numbered tag affixed to the base and give each head a colored twist tie, so that each head has a unique tag/twist-tie combination, or “head ID”, under which we store all phenology data. We monitor the flowering status of all flowering plants in the remnants, visiting at least once every three days (usually every two days) until all heads were done flowering to obtain start and end dates of flowering. 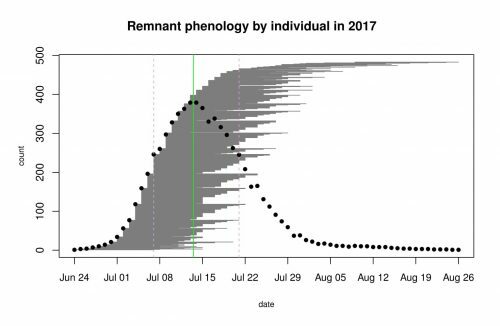 We managed the data in the R project ‘aiisummer2017′ and will add it to the database of previous years’ remnant phenology records. GPS points shot: We shot GPS points at all of the plants we monitored. The locations of plants this year will be aligned with previously recorded locations, and each will be given a unique identifier (‘AKA’). We will link this year’s phenology and survey records via the headID to AKA table. You can find more information about phenology in the remnants and links to previous flog posts regarding this experiment at the background page for the experiment. For the past three years, studying phenology in the remnants has been a major focus of our summer field work. The motivation behind this study is to understand how timing of flowering affects the reproductive opportunity and fitness of individuals in natural populations. Stuart began studying phenology in remnant populations between 1996 and 1999 and several students also studied certain populations in following years. From 2014-2016, we tracked phenology in all of our remnant populations. This year there were 1040 flowering plants (1500 flowering heads). Flowering began on June 18th with one plant at the East Riley roadside remnant. Sadly, this early bloomer was mowed just 6 days after it started flowering. The latest flowering plant shed pollen in the West Unit of Staffanson Prairie Preserve on August 17th. When we consider all populations together, peak flowering was on July 10th. Peak flowering at Staffanson Prairie Preserve was later, on July 18th, likely due to the prescribed burn in the West Unit setting flowering back. Line segments represent the duration of flowering for each remnant population. Click to enlarge! As you can see in the figure above, some populations had much longer duration of flowering than others. 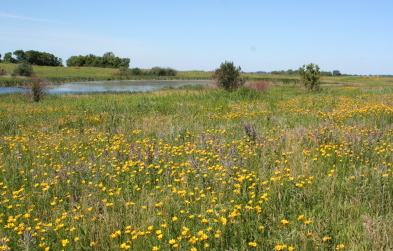 Flowering duration at Staffanson Prairie Preserve (‘spp’ in the figure) was longer because the west unit was delayed in flowering. East Riley (‘eri’) has a long duration of flowering, likely due to individuals being mowed early in the season, then resprouting and flowering later. This figure shows the very first and last dates of flowering, but population mean start and end dates of flowering is also informative (see what that flowering schedule looks like here). 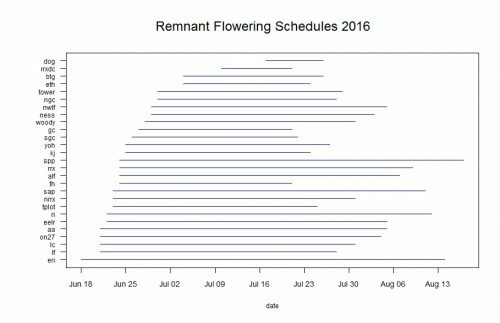 These figure with generated with R package mateable, which was was developed by Team Echinacea to visualize and analyze phenology data. We harvested a random sample of 5 heads from most remnant populations (we excluded very small populations) and brought them back to the lab, where student interns will process and assess their seed set (‘regRem’ or ‘regular remnant harvest’). We also harvested the most isolated, least isolated, earliest flowering, and latest flowering individuals from large populations (‘remnant extremes’). Student interns will also process and assess seed set of these heads. Data collected: We identify each plant with a numbered tag affixed to the stem and give each head a differently colored twist tie, so that each head has a unique tag/twist-tie combination, or “head ID”, under which we store all phenology data. We monitor the flowering status of all flowering plants in the remnants, visiting at least once every three days until all heads were done flowering to obtain start and end dates of flowering. We managed the data in the R project ‘aiisummer2016′ and will add it to the database of previous years’ remnant phenology records. GPS points shot: We shot GPS points at all of the plants we monitored except for four, two at SGC and two at ERI, which were mowed (ERI) or dug up (SGC) early in the season. These points were shot under job names following the convention “SURV_2016MMDD_SULU” or “SURV_2016MMDD_CHEK”. The locations of plants this year will be aligned with previously recorded locations, and each will be given an identifier (‘AKA’). We will link this year’s phenology and survey records via the headID to AKA table. So it begins! Two new externs have joined Team Echinacea from Carleton College. We (Mikaela and Emma) will be here every day for the next three weeks, and are excited to discover new revelations for the Asynchrony, Isolation and Incompatibility experiment. 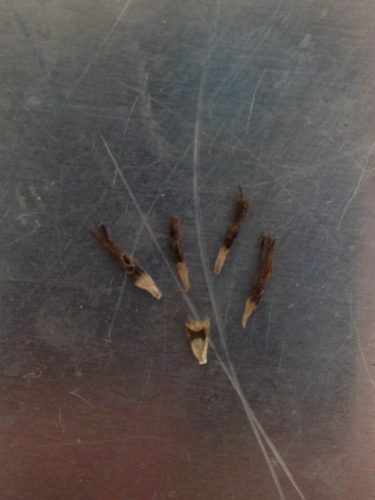 So far, most of what we’ve discovered is that cleaning Echinacea seed heads is tedious. Two days in, we have cleaned 36 seed heads; scanning them was a nice relief from the monotony. We think we could get through all 110 by the end of this week. Although yesterday was quiet, there was a little bit of commotion: Mikaela’s second seed head had a rare deformity. Many of the achenes were uninformative. This means they were aborted part of the way through formation, so it cannot be determined whether they were fertilized. After minutes of puzzled deliberation, Stuart, Amy and Scott decided to keep them in the sample. Four uninformative achenes compared to one normal, small-to-mid-size achene. Because of their immaturity, the florets are still firmly attached. In contrast to yesterday, today there were quite a few volunteers and a couple of students who we got to meet. It was nice to talk to other people who were involved in and excited about this project. We also got to hear about other experiments going on in the lab besides our own. 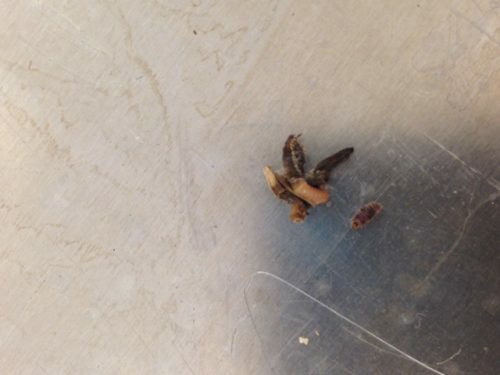 Today’s seed cleaning also presented an exciting moment: just moments after Amy told us about last year’s larval discoveries, we each found a live larva residing in the heads we were cleaning. We’re thinking about raising these mystery larva so we can finally learn just what they are. Hopefully we’ll have more success than last year’s effort! Our two larva. Emma’s is the tiny brown one on the right, and Mikaela’s is the pink one hanging out on a makeshift habitat of chaff. We are grateful for this opportunity to contribute to and learn from the project, and are looking forward to the next three weeks! I am excited to present to you my summer 2016 research proposal. 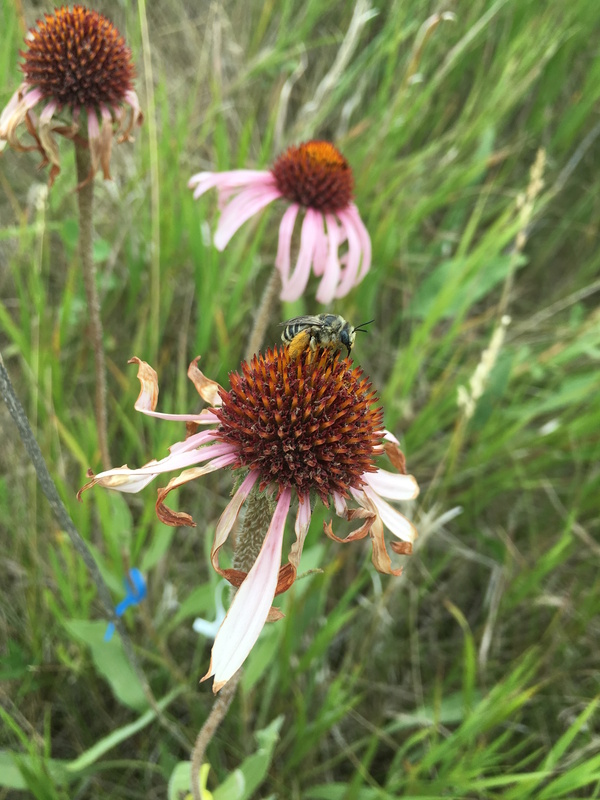 While previous research has shown that isolated Echinacea plants and populations experience reduced reproductive fitness, we have not looked at what influence edge effects may have on Echinacea populations. Findings presented in Ison and Wagenius 2014 showed that plants in P1 experienced slight edge effects on seed set. My research this summer will use style persistence data collected from all remnant sites and quantify the relationship between distance of an Echinacea plant from a habitat edge and average style persistence. This will help us understand if fragmented populations are being harmed by yet another factor. Hopefully you find this topic as interesting as I do. Beginning in 1996, Team Echinacea has monitored the flowering phenology of Echinacea angustifolia in remnant populations around Solem Township. The number of populations and plants we visit has varied over the years; a summary of which populations were monitored in each year can be found at this link. In 2015, we monitored phenology of 1763 heads on 1384 plants at 27 remnant populations. Whew! That is about 400 more flowering individuals than in 2014 although we monitored the same populations. Populations with big increases in numbers of flowering individuals from last year include Aanenson, East Riley, Landfill, and On 27. At each population, we identify all flowering individuals and track their development over the course of the season, gathering data on start and end dates of flowering for every individual. Flowering began at Loeffler’s Corner on June 23rd and ended at Aanenson on August 19th. We will use this data to describe temporal flowering patterns within and among remnants and relate this to potential for successful mating in populations. Blue line segments indicate the period of time that at least one individual was flowering at each population. The numbers to the left of the lines indicate the number of individuals that flowered from each population in 2015. Click to enlarge! Look here to read previous flog posts about this experiment. Team members who have worked specifically on this project include: Amber Zahler (2011), Kelly Kapsar (2012), and Sarah Baker (2013), although gathering phenology data was a whole team effort in 2014 and 2015. 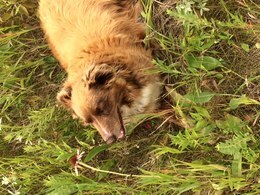 Flog posts authored by Kelly, Amber, and other team members may provide additional details about day-to-day activities associated with our flowering phenology monitoring project. For her RET project, Lea gathered data to study the relationship between flowering density and seed set. She worked at Staffanson Prairie Preserve, which appears to have higher flowering density in burn years than non-burn years. This year, 2015, was a non-burn year. Lea and Team Echinacea kept track of the style persistence of about 50 individuals for which we have seed set information from prior burn years. These individuals were harvested and their achene count and seed set will be assessed in winter 2016 by Gordon Younkin, an undergraduate intern from Northwestern University. Gordon will work to build a model of seed set in Staffanson in a non-burn year and aims to compare this model to a burn year. Products: Lea is developing a dataset and lesson plan for high-school students to compare individual plants’ style persistence in burn years and non-burn years to test hypotheses about seed set in high- and low- flowering density. 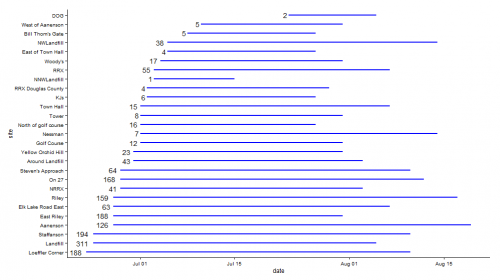 This lesson will introduce students to R and its use in data management and statistical analysis. Read other flog posts about this experiment. This project investigates the role of three fundamental constraints on mate availability – temporal asynchrony, spatial isolation, and reproductive incompatibility – in remnant Echinacea angustifolia populations. During the summer of 2014, we conducted two studies related to The Mating Scene project. In the first study, we mapped 991 Echinacea plants and monitored the phenology of 1360 flowering heads across 31 remnants to quantify spatial isolation and flowering asynchrony. At the end of the season, we harvested 193 flowering heads from 25 remnants to assess seed set. In the second study, we performed 364 pollen crosses to characterize patterns of reproductive incompatibility within 10 remnants. With the data collected in 2014 and subsequent years, we aim to elucidate how the interactions between temporal asynchrony, spatial isolation, and reproductive incompatibility influence reproductive fitness in fragmented prairie remnants. Products: The phenology and compatibility datasets need to be made readyR. The harvested flowering heads are being processed at the Chicago Botanic Garden. Today was a great day for Team Echinacea! After a quick morning of remnant phenology, we finished measuring Lydia’s Experimental Plot 09!!! On the Northwest Phenology Route, all flowering Echinacea at East Elk Lake Road and North West of Landfill have finished flowering. It is pretty cool to think of how long we have been returning to these sites for phenology, and now many of them are wrapping up (and quickly!). In the afternoon Elizabeth, Gretel, Jared and I were busy working on demography at East Riley, Riley, Railroad Crossing, and North of Railroad Crossing. Other team members went to KJ’s to look for seedlings that teams have been following in years past. On the pollinator note comes a follow up from Steve Ellis’s talk with us last Friday. I recently came to learn that the city of Shorewood, MN has passed a law banning the use of neonicotinoids!!!! Shorewood now joins the all too small list of cities banning neonics, including Eugene, Oregon and Spokane, Washington. Although this is a small step towards protecting the bees, Shorewood has made a very important statement. Check out the Star Tribune article about the recent ban, along with a post on the Beyond Pesticides Daily News Blog! Today we spent the morning doing remnant phenology. It seems that we are getting to the end of flowering and phenology is going faster and faster. During phenology we collected pollen that will be freeze dried and used for crosses next summer! Woah! While I was collecting pollen from the single flowering plant at the DOG site, the elusive three legged dog came to visit me. She fell down by me and panted while I collected the pollen. In the afternoon we furiously measured Experimental Plot 1. Gretel and I raced other groups aswell as each other, finishing four rows before we called it a day and headed in.